Brutus Truck Bodies by Nor-Mar Industries Ltd. are designed for the harsh forestry, construction, mining, and oilfield sectors of the rugged Canadian environment. This demanding landscape has led Brutus to develop heavy-duty truck bodies that utilizes the finest materials, construction standards, and equipment so your truck body will give you a long trouble free life. The company’s founder and president Gerry Turchak envisioned and created our first truck body called the “Brutus Box” back in 1981. In that year one of Gerry’s truck dealership customers came to the shop with a destroyed pickup box, after unsuccessfully trying to move a skidder tire to town from his logging site. Gerry and the customer agreed that it would be nice if somebody would build a pickup box that could handle the rough and tough environment of his logging operation. After some experimentation the first Brutus Box was built and became an immediate success, soon customers were asking us to add cabinets and other features to their Brutus Boxes. From that point on Nor-Mar Industries Ltd. was created and began the long road to truck body manufacturing, today we still build the Brutus Box along with a wide range of custom steel and aluminum truck bodies for customers across North America. 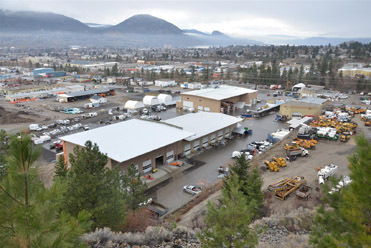 Customers and visitors alike are always welcome to come see us hand build our custom bodies at the plant, if you are visiting the Okanagan Valley please drop in and say hi.